‘Surface Design’ is an umbrella term used to describe the creation of pattern, texture or imagery on cloth. It encompasses arguably every technique but in this instance, I want to focus on artists who create their work using predominantly wet processes. 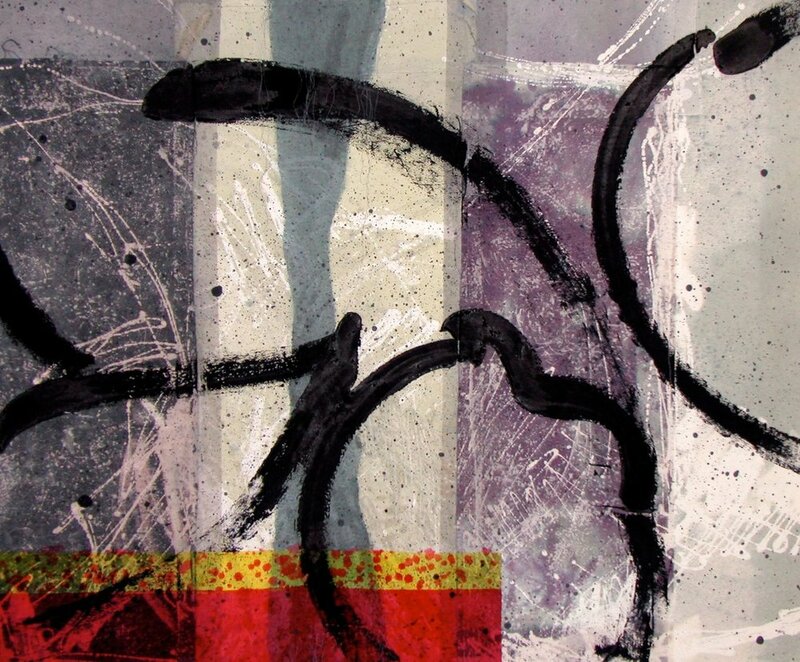 These include painting, screen printing, mono printing, scraping and a huge array of mark-making techniques often using ‘found’ or everyday tools. A wide range of media is also employed from dyes (for example fibre-reactive, acid and natural dyes), fabric and acrylic paints, expandable paints, etching or devoré medium and discharge (colour removal) media. Some of this media involves a chemical reaction inside the fibre of the cloth (In). Some sit on the surface (On) and some eat or etch away (Under). Cloth in any form is flexible and giving and own experience of surface design has informed me that you can do almost anything to it and it will respond. Colour, discharge, tear, burn, etch, stiffen, glue, laminate, embed – the list is endless. Let’s take an initial look at contemporary artists who use surface design to create cloth that is unquestionably art. 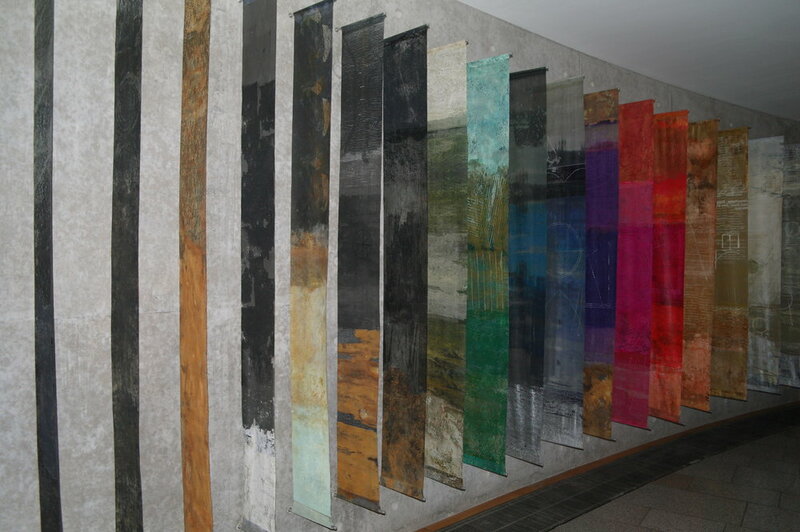 I heard about Starszakowna in 2004 after her installation – ‘Hinterland’ - was hung in the Scottish Parliament Buildings. Exquisite and fascinating, Hinterland consists of eighteen silk organza panels that combine digital printing, hand painting and embossed detailing. It reflects the landscape, industries, cultural history and tradition of innovation in Scotland, and simply glows. The methods used to create them are very much in, on and under the surface. In 2010 I made a flying visit to the Stroud International Textile Festival to specifically see Starszakowna’s work in the flesh. I was not disappointed and spent a good couple of hours just looking and becoming lost in the stories that are embedded in her work. 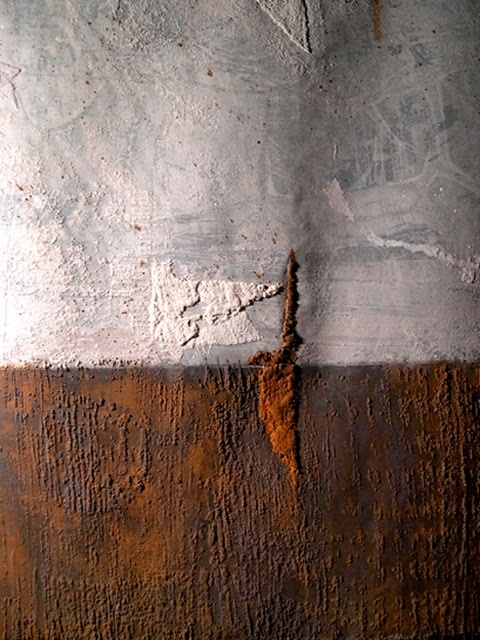 The success of Starszakowna’s experimental and innovative methods were recognised as early as 1977, when she received a Scottish Arts Council Award for research in to new processes. Most of her practice (and teaching) has been focused on the three dimensional surface qualities that can be achieved during the printing and dyeing process. Her textiles deal with the complex relationships which link the past with the present, and The Contemporary Textile Collection at the V&A has a significant acquisition in ‘Diasporas’. The V&A describe it as “made of white silk organza, screen-printed pigments and heat reactive media, it is the latest in a series of textile hangings which relate directly to the history and memories embedded in walls and buildings. Each piece is inscribed with fragments of graffiti and messages that are highly evocative and include subtle references to both universal truths and highly personal experiences” . 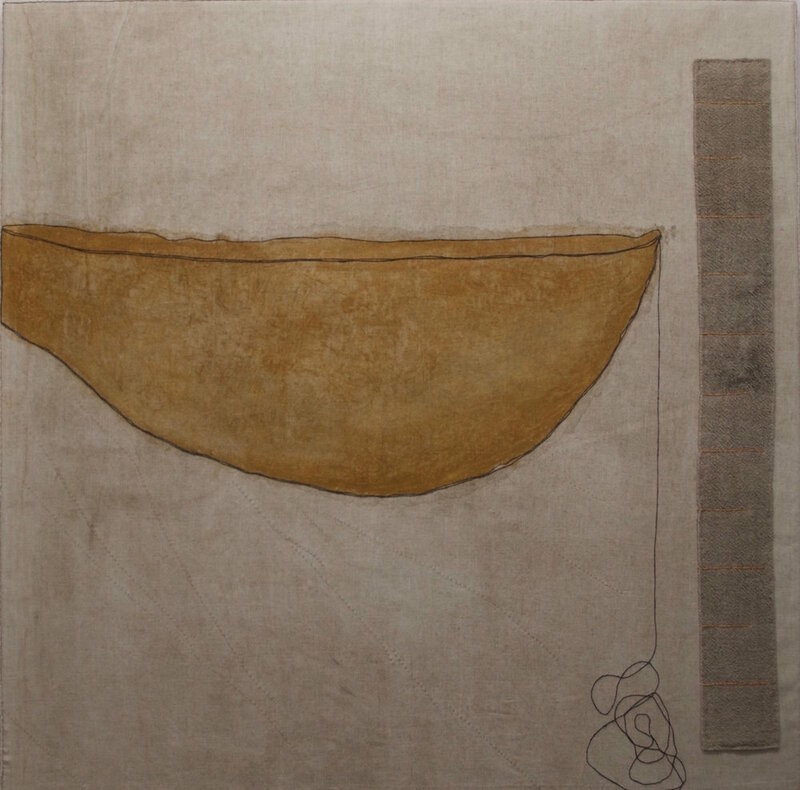 Carole Waller describes one aspect of her practice as “making paintings” , often on un-stretched cloth that hangs in space or against a wall, and paintings that are laminated between glass. I saw these exhibited outdoors at Westonburt Arboretum by chance. Whilst visiting a friend up in that neck of the woods, she casually mentioned that “some kind of textile art in glass is being exhibited outdoors at Westonburt – do you want to have a look?”. Of course I did, so we spent a happy half-day enjoying Westonburt itself whilst being captivated by Waller’s luminous textile ‘sculptures’. The toughened glass panels are laminated with UV resistant resin, creating a durable glass structure that can be used indoors or out as it withstands extremes of temperature, light and weather. Waller’s panels can also be used as free-standing artworks, set into walls as an architectural feature that utilises light, or as screens or room dividers that double as artworks. A brilliant development of how textiles can be used. The other side of Waller’s practice focuses on clothing or what is known as ‘Art to Wear’ or in the U.S.A., ‘Wearable Art’. Using (mainly) silk, she paints fibre-reactive dyes directly on to the cloth, making a wearable and washable ‘painting’ with incredible richness of mark, colour and depth. Fittingly, Waller calls her collection ‘I’m no Walking Canvas’ . In the USA, Jane Dunnewold was responsible for coining the term ‘art cloth’ and encouraging makers to use a variety of tools and combine different media on a single piece of cloth. Her book ‘Complex Cloth’ both educated and inspired. Leslie Morgan and I brought the principle of ‘layered’ cloth in to the U.K. when we formed Committed to Cloth, but preferred to use the term ‘compositional cloth’ to further aid the fact that cloth in itself could be an artwork. Some students did just this, mounting the cloth on stretchers or letting it simply hang free, whilst others took the surface design techniques and created cloth for use in whole cloth quilts, or for cutting and restructuring. Here are a few examples, starting with a wholecloth quilt by Leslie Morgan where the thickened dye paints were applied with a single tool; an old credit card. A perfect example of how little is needed to execute an idea. Next we see an early work by Christina Ellcock (Paper Fruit) that I still consider to be an excellent example of great surface design, where the original idea came from various still life studies of a bowl of fruit. The media used included thickened dye paint and discharge media through the use of resists, scraping, painting, spattering and dribbling. You can see more of her work at www.unfoldtextiles.christinechester.com, where you’ll also see the work of Christine Chester, Vanessa Marr, Sara Heatherly, Carly Ralph and Sarah Welsby. Claudia Helmer www.claudiahelmer.com has made the process of paper lamination her own, using it to create a body of work called ‘Die Gedanken sind Frei’ and latterly, for a body of work based on trip to Alaska, all of which used paper lamination on top of hand dyed cloth with machine stitching. Charlotte Yde from Denmark also uses a wide range of surface design techniques in her quilts, as we can see from the next image of an early work (an old favourite of mine) called ‘Bloody Garden’. In addition to quilts, Charlotte has also been engaged with drawing through stitch, so do visit her website to see the full range of what she engages with www.yde.dk . Lastly, I’ll mention Susie Koren who I’ve worked with for many years. In the past Susie explored wax resist and discharge processes on black cloth as a basis for her hand stitching but in the last four to five years, she’s been focused on working with raw earth pigments to create surface texture on her cloth, which she then (of course!) hand stitches. Fabulous work. To see more visit www.susiekoren.com and www.viewseven.com. I could go on as there are many, many talented artists creating great art using surface design techniques and processes. I hope you’ve enjoyed this short introduction. Click here for a downloadable PDF of the above article, "In, On and Under the Surface"
If you would like notification of future blogs on Art Textiles please sign up here.